In inviting people into this work, I am inviting them not into what the work is about, as if there is only one perspective of one idea on view, but I’m inviting them into the many things that they will encounter. 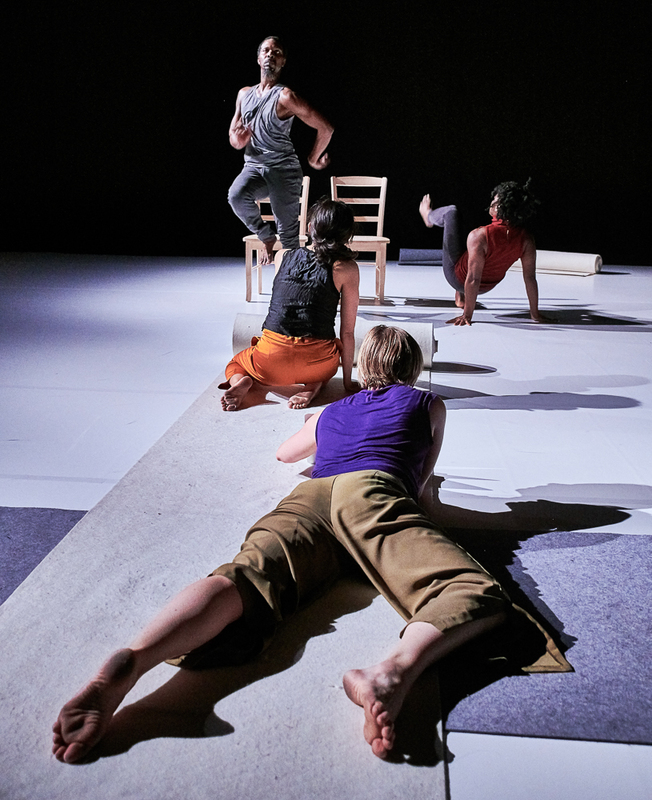 Kristi: After the premiere of “In a Rhythm,“ one reviewer from Columbus, Ohio stated, “”In a Rhythm“ serves as a perfect introduction for anyone who has yet to crack (the modern dance) language.” What do you think is particularly accessible about this work? These are people (on stage), people whose bodies and actions, in relationship and as singular humans, function from the same ground as they do. Bebe: People are responding to the piece because it reaches out on a human level. These are people (on stage), people whose bodies and actions, in relationship and as singular humans, function from the same ground as they do. And here’s a story to listen to, as an entry into the event. It’s a swing between dance, music they recognize, some talk about ideas in the room, more dancing, a shift of tone, etc., etc. They are involved in a wash of what is familiar and possible and unexpected. The work starts with an invitation. It’s as simple as introducing the dancers. They come out and they see us, and then I go into a conversation. I have this bit of information that I am giving to set the stage for where the piece began, because the beginning is not necessarily what they will see. In inviting people into this work, I am inviting them not into what the work is about, as if there is only one perspective of one idea on view, but I’m inviting them into the many things that they will encounter. The point for me as choreographer is not so much to demonstrate a point of view, but to have one, and go from there. The process of making a piece reveals itself to me rather than conserving my own sense of what should happen. Often, I feel that people expect that dance will be about a thing, and when they don’t see it, they feel confused. If we really look at other art forms and life forms, there is so much that is there that we don’t necessarily “get,” and the answers are not singular, but still we are drawn into the moment. The point for me as choreographer is not so much to demonstrate a point of view, but to have one, and go from there. The process of making a piece reveals itself to me rather than conserving my own sense of what should happen. I want the dance to do that for the audience as well. The building of this work has taken us through a chronology of dance making, trains of thought, events common to many of us politically and socially that have occurred in the last year or so – all kinds of things that have made an imprint on what we do in the studio. Kristi: Dance has been described as a “fleeting art form”, but that phrase is often attached to what audiences witness on stage and is rarely associated with what goes on inside the studio. “In A Rhythm” is part of a larger project called “The Making Room” (a project that aims to preserve and share the process of dance-making) and is now the capstone performance for the Process v. Product Festival at the Dance Center. Why is it vital to share not only the performance, but also the process of creation with your audiences? Bebe: I’m interested in sharing this process because that is really where we’ve been spending our time. The building of this work has taken us through a chronology of dance making, trains of thought, events common to many of us politically and socially that have occurred in the last year or so – all kinds of things that have made an imprint on what we do in the studio. The online Portal (themakingroom.org) that tracks our process gives some sense of what that mix of influences has engendered. I love the idea of sharing those moments that seem to reveal themselves right in front of you. They are fleeting, indeed, but also catalytic. I also love rehearsals! I love the idea of sharing those moments that seem to reveal themselves right in front of you. They are fleeting, indeed, but also catalytic. One feeds the next and the next. I wrote much of the text that accompanies the videos and audio in the Portal in retrospect, closer to the end of the project. It was interesting trying to capture the unfolding of certain sections while knowing how they resolve. Audiences generally see only the resolution of a complex weaving of points of process. I’m happy to offer this other view, and hope that those who’re interested in it will take it in. The Dance Center of Columbia College Chicago presents Bebe Miller Company’s “In A Rhythm” April 5, 6, and 7 at 7:30pm at 1306 Michigan Avenue, Chicago, IL 60605. There will be a post-performance conversation on Thursday, April 5. A pre-performance panel will take place on Friday, April 6 at 6:00 p.m. at Sherwood Community Music School recital hall, 1312 S. Michigan Ave. Purchase tickets online https://events.colum.edu/event/bebe_miller_company or call the box office at (312) 369-8330.